Reverend Fernando and Hasantha Hewahasanji distribute wheel barrows to building supply shop. 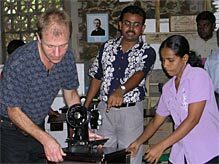 Taylors in Tangalle with new sewing machine. During our visit in early April we met with many of the displaced and the camp administrator. Apparently, with our support in equipment and tools, more than 80% of the recipients had resumed their work and were able to make a living of it. Good examples were two vendors of chickpea snacks and of ice cream who had lost their vehicles and were able to rebuild them. Tree fellers and carpenters also were busy. One carpenter had set up his workshop in the camp and was making cabinets. The seamstress had, with her new pedal-driven machine, sewn school uniforms for kids in the camp. Some of the recipients did not feel like going back to work, and instead relied on the meager government support. As this will be phased out in a few months, they will at least have the means to resume their work. We are now working with a few families who would like to purchase larger items, such as a chain saw or set up a new food stall. Because it would be unfair to the other families, support of more than $100 will be given as a “soft loan”, i.e., free of interest and with lenient repayment conditions. Since our team members can easily reach Moratuwa, we will continue to closely watch progress and offer needed support. The south coast town of Tangalle was hit very hard by the tsunami. About 1,000 of the population of 8,000 lost their lives, 90% of the local fishing boat fleet of about 150 was destroyed and so were many homes and small guest houses right on the beach. The displaced, many of whom are fishermen, merchants or food vendors, now stay in temporary shelters or with relatives. Devastation is extensive in the port and along the beaches while just 100 yards inland, no impacts are visible. 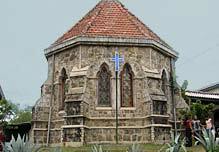 Gordon de Silva knew that the local Methodist church had started their relief program for a mostly Buddhist population immediately after the tsunami. Funds from the church’s headquarters allowed them to provide food and kitchen utensils when there was initially no government support. They also ran an orphanage but did not have the funds to support the recovery of small businesses and were pleased to work with us. Initially, an interdenominational committee made up of Reverend Fernando, a local Buddhist monk, a school teacher and our team member Hasantha Hewahasanji surveyed the most affected parts of town, established a list of priority needs and purchased the selected items. Again, in order to reach as many families as possible and to avoid the appearance of favorism we limited the support to about $100 per family. Since mid March we have supported about 65 families/businesses in Tangalle. One distribution of goods took place during our visit in early April. Many families received bicycles to give them back the mobility they need in their trade business. 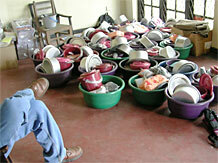 Others received sewing machines for the commercial sewing and repair of garments. We also helped a bicycle repair shop, a supplier of building materials, and several small restaurants. We visited several recipients who were using their sewing machines and bicycles from the first distribution in March. Particularly fish merchants, who buy fish right on the beach when the catch comes in need bicycles and cooling boxes to distribute the goods. Fish is available locally, brought in by the few boats, which survived the tsunami or by lagoon fishermen who require only small canoes.